This amazing pile of rubber was donated by our friends at Alluring Impressions. I didn't count the pieces, but your eyes don't deceive you -- there is a huge pile there for some lucky winner! These stamps are outstanding! 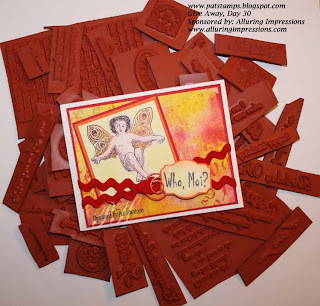 Deeply etched with beautiful designs...what else does a stamper need? Alluring Impressions is GREAT. Along with the stamps, you will receive the eye candy on the left. 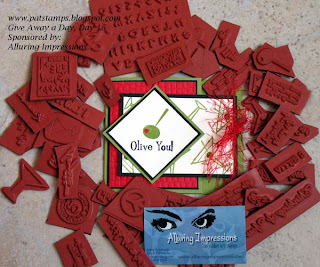 All of the stamps used are by Alluring Impressions, and the background technique is Faux Flocking from the June 2007 issue of the Technique Junkie Newsletter. We should all have a little sparkle in our life, right? ANYONE can enter. One entry per person, per daily give away please. To enter the give away for today, simply leave a comment on this blog entry telling me that you would like to enter by 11:59pm EST on Wednesday, October 24th. No other entry methods will be included in the give away. If you email me to enter, your entry will NOT be considered a valid entry. When you leave the comment, make sure to put your NAME in the comment -- if you enter your comment as "Anonymous", I cannot give you the prize! Blogger does NOT record your email address for me, so you will need to check back to find out if you have won or include your email address in your comment so that I can notify you. I will have a random number generator pick a number from the comments to select the winner. Each give-away is separate, so to be eligible for a specific item you must enter that day's contest on the post where it is listed.Check back every day during the month of October for the daily giveaway -- you can enter EVERY day! A fabulous Grand Prize will be offered on the last day of the month, too. Enter today -- good luck! The winner of this Give Away is Shelly Banghart! Congrats, Shelley! WOW - Give Away Day 22 - It's BIG! Hey! It's Monday and I have a great give away for the Technique Junkie Newsletter Anniversary Celebration today. 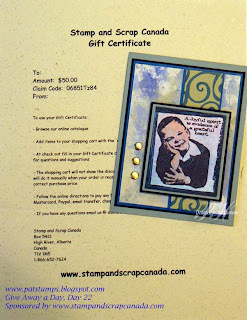 This give away is for a $50.00 gift certificate to Stamp and Scrap Canada! I think this is an amazing, amazing give away. 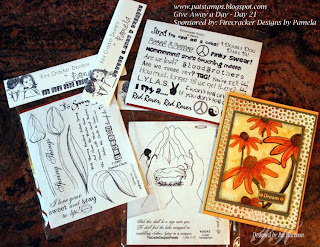 There are top-of-the-line stamp companies like Chapel Road, Paper Bag Studios, Non-Sequitur, Paper Artsy, My Sentiments Exactly, Inkadinkadoo, Stampington, House Mouse -- there are just too many to list! What a shopping spree our lucky winner will have in store for herself! 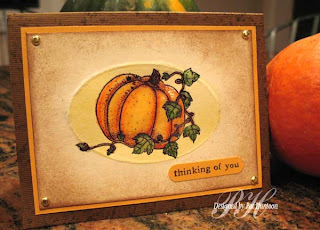 Today's eye candy -- the card that will go along with this give away -- was made using Paper Bag Studios Stamps. 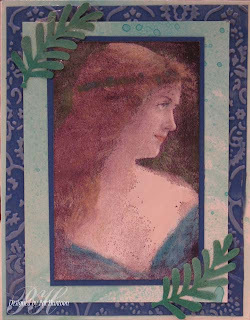 The Green and Blue background is a Fossilstone background (in the April 06 issue) with added Perfect Pearls for shimmer; the image itself was stamped on a Spectrum Roll piece (8-05 issue) . I then added color with colored pencils. ANYONE can enter. One entry per person, per daily give away please. To enter the give away for today, simply leave a comment on this blog entry telling me that you would like to enter by 11:59pm EST on Tuesday, October 23rd. No other entry methods will be included in the give away. If you email me to enter, your entry will NOT be considered a valid entry. When you leave the comment, make sure to put your NAME in the comment -- if you enter your comment as "Anonymous", I cannot give you the prize! Blogger does NOT record your email address for me, so you will need to check back to find out if you have won or include your email address in your comment so that I can notify you. I will have a random number generator pick a number from the comments to select the winner. Each give-away is separate, so to be eligible for a specific item you must enter that day's contest on the post where it is listed.Check back every day during the month of October for the daily giveaway -- you can enter EVERY day! A fabulous Grand Prize will be offered on the last day of the month, too. Enter today -- good luck! 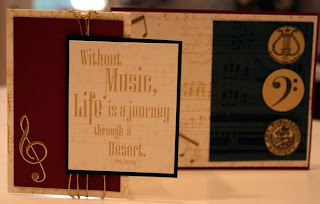 My apologies -- not for the prize, because it is wonderful -- but because the card has been posted to this blog before. Yesterday I had 5 of my favorite people here scrapping all day and night, and I meant to make a card for the Give Away -- but I chose to scrapbook instead. So please forgive my indulgence to myself. I love the card, anyway, and I hope you don't mind it again. Now, for the good stuff! 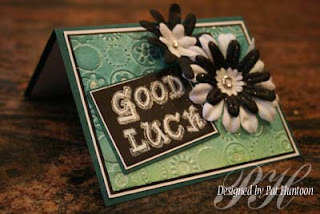 Today's fab Give Away is sponsored by Firecracker Designs by Pamela. 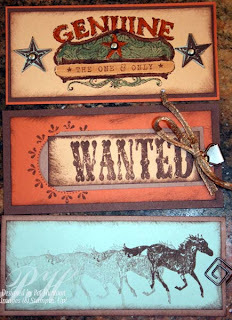 These three great stamp sheets can be yours if you win this Give Away! 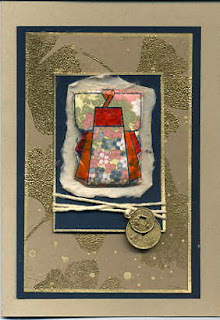 The Firecracker Designs by Pamela team are active members of the Technique Junkie community and it is a joy to offer Pamela's beautiful designs to you. Go take a peek at Pamela's website and place an order today! 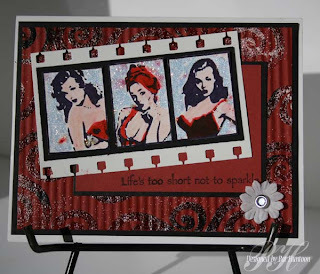 This card uses some of the beautiful stamps offered by Firecracker Designs by Pamela. 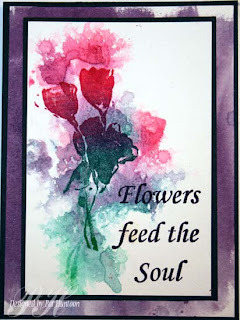 I used the Marker Wash technique to color the flowers and the Cuttlebug Smoosh technique for the base background. 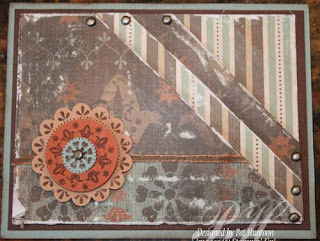 Both techniques may be found in the October 2007 issue of the Technique Junkie Newsletter. If you are not subscribed by now, what are you waiting for? At just $3.00 an issue, it is a bargain...for crying out loud, most people blow $3.00 at Starbucks every time they walk in the door -- and the newsletter has a better kick than Caffeine! ANYONE can enter. One entry per person, per daily give away please. To enter the give away for today, simply leave a comment on this blog entry telling me that you would like to enter by 11:59pm EST on Monday, October 22nd. No other entry methods will be included in the give away. If you email me to enter, your entry will NOT be considered a valid entry. When you leave the comment, make sure to put your NAME in the comment -- if you enter your comment as "Anonymous", I cannot give you the prize! Blogger does NOT record your email address for me, so you will need to check back to find out if you have won or include your email address in your comment so that I can notify you. I will have a random number generator pick a number from the comments to select the winner. Each give-away is separate, so to be eligible for a specific item you must enter that day's contest on the post where it is listed.Check back every day during the month of October for the daily giveaway -- you can enter EVERY day! A fabulous Grand Prize will be offered on the last day of the month, too. Enter today -- good luck! The winner of this Give Away is Deb Bryson! Congratulations, Deb! Give Away a Day -- TWENTY! Before I get into the give away for day 20, I have to just tell you that I am having a rockin' great time reading your comments! Whether you are writing me a poem, begging, bribing, whining (in the best way, of course) or just being humorous, the comments are enormously fun to read. I try to read them all...Thank you for the 20 days of entertainment!! 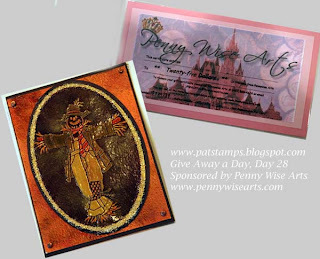 Today's Give Away to celebrate the Technique Junkie Newsletter 5th year anniversary is brought to us by Penny Wise Arts. 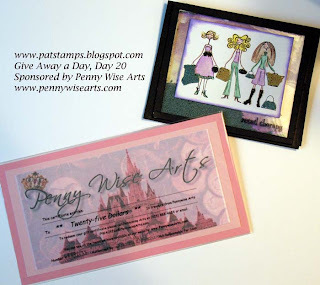 The lucky recipient of this Give Away will receive a $25.00 gift certificate from our friend at Penny Wise Arts. While you are waiting for the winner to be chosen, why don't you go visit the Penny Wise website -- they need YOUR help to accomplish their goal to "Bead the World!" The card made for today was designed to help Bead the World, too. 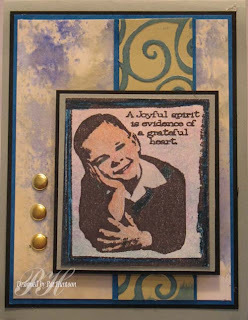 This shaker card uses Stamping Bellas for the main image, and teal, gold and black metallic beads (from Penny Wise, of course, they are so pretty!) to fill the shaker and to cover the bags, shoes, belt and handbags of my shopping chicks. 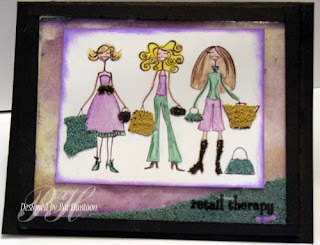 The background is Watercolor Distress from the February 2007 issue of the Technique Junkie Newsletter, and the girls were colored with Gamsol Pearls from the June 2006 issue of the newsletter. 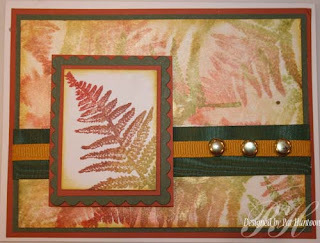 this card will be mailed to the winner of the Give Away with the Penny Wise Gift Certificate. ANYONE can enter. One entry per person, per daily give away please. To enter the give away for today, simply leave a comment on this blog entry telling me that you would like to enter by 11:59pm EST on Sunday, October 21st. No other entry methods will be included in the give away. If you email me to enter, your entry will NOT be considered as a valid entry. When you leave the comment, make sure to put your NAME in the comment -- if you enter your comment as "Anonymous", I cannot give you the prize! Blogger does NOT record your email address for me, so you will need to check back to find out if you have won or include your email address in your comment so that I can notify you. I will have a random number generator pick a number from the comments to select the winner. Each give-away is separate, so to be eligible for a specific item you must enter that day's contest on the post where it is listed.Check back every day during the month of October for the daily giveaway -- you can enter EVERY day! A fabulous Grand Prize will be offered on the last day of the month, too. Enter today -- good luck! The winner of this Give Away is Nancy Kestin! Congratulations, Nancy! 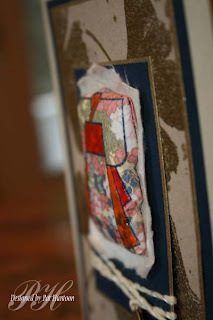 The Bloggers Challenge this week was to create something that was inspired by something around us. Last week my brother and SIL came from Chicago to Connecticut to spend a week with me and my family. Two of those days we went hiking. New England is known, of course, for our beautiful foliage -- so we were hoping to see nature in her full glory. Well...that was the hope! We have had unnaturally warm weather this month and last, so the leaves have been hesitant to grace us with their full splendor! Of course, there were some trees that had changed...and I always find so much inspiration in their natural perfection. So Today's Challenge was inspired by the leaves from our hikes. 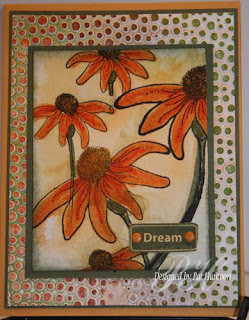 The Marker Wash technique from the October 2007 issue of the Technique Junkie Newsletter was a natural for this inspiration. 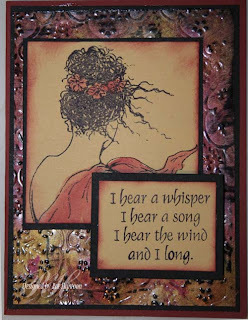 I really love this card -- It just seems to fit naturally with the background that says "We are not humans on a spiritual journey, we are spiritual beings on a human journey." Now THAT is inspirational, isn't it? Please take a moment to visit the other ladies in the Bloggers Challenge group (listed in the sidebar on the left). They are wonderful artists and I think you might find their work inspirational, too! ANYONE can enter. One entry per person, per daily give away please. To enter the give away for today, simply leave a comment on this blog entry telling me that you would like to enter by 11:59pm EST on Saturday, October 20th. No other entry methods will be included in the give away. If you email me to enter, your entry will NOT be considered as a valid entry. When you leave the comment, make sure to put your NAME in the comment -- if you enter your comment as "Anonymous", I cannot give you the prize! Blogger does NOT record your email address for me, so you will need to check back to find out if you have won or include your email address in your comment so that I can notify you. I will have a random number generator pick a number from the comments to select the winner. Each give-away is separate, so to be eligible for a specific item you must enter that day's contest on the post where it is listed.Check back every day during the month of October for the daily giveaway -- you can enter EVERY day! A fabulous Grand Prize will be offered on the last day of the month, too. Enter today -- good luck! The winner of this Give Away is Lynne Malinowski! Congratulations, Lynne! 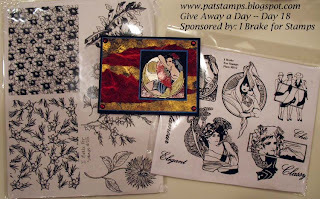 Today our beautiful Give Away is sponsored by I Brake for Stamps. 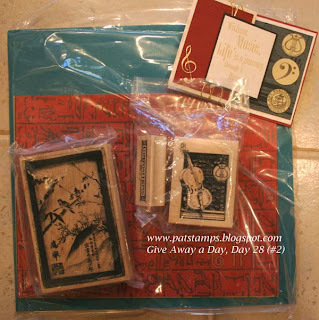 One lucky winner will receive these two gorgeous stamp sets! These images are so beautiful...are you the lucky winner? Today's card features an image from an identical I Brake for Stamps sheet as YOU will receive (assuming you are the winner, of course!). It was a natural image to use with the Spanish Gold Technique from the October 2007 issue of the Technique Junkie Newsletter. 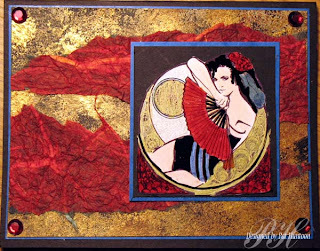 My dancer was colored with gel pens, and the red paper is handmade (but not by me!). 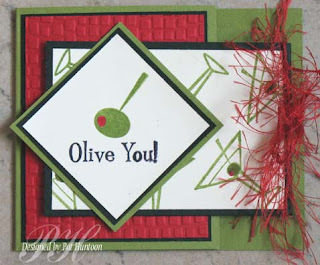 Of course, this card will be send with the stamp sheets to the winner. ANYONE can enter. One entry per person, per daily give away please. To enter the give away for today, simply leave a comment on this blog entry telling me that you would like to enter by 11:59pm EST on Friday, October 19th. No other entry methods will be included in the give away. If you email me to enter, your entry will NOT be considered as a valid entry. When you leave the comment, make sure to put your NAME in the comment -- if you enter your comment as "Anonymous", I cannot give you the prize! Blogger does NOT record your email address for me, so you will need to check back to find out if you have won -- or include your email address in your comment so that I can notify you. I will have a random number generator pick a number from the comments to select the winner. Each give-away is separate, so to be eligible for a specific item you must enter that day's contest on the post where it is listed.Check back every day during the month of October for the daily giveaway -- you can enter EVERY day! A fabulous Grand Prize will be offered on the last day of the month, too. Enter today -- good luck! The Lucky winner of this Give Away is Nina Perrin! Congratlations, Nina! Day 17 already! Where has the time gone? I hope you have been having fun with the daily give aways, and I hope you have been taking a few minutes each day to click through to the sponsor's links to visit their sites and shop. Each of our sponsors have been very generous -- please show them you appreciate them by patronizing their "establishments!" 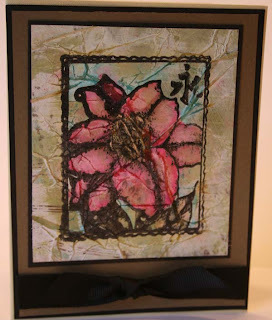 Our sponsor today for the give away a day is Innovative Stamp Creations. 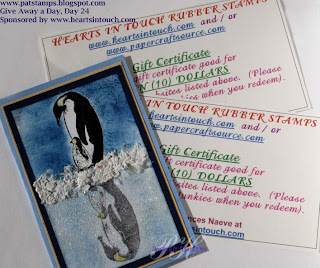 The lucky winner of today's Give Away will receive these two stamp sheets plus the card shown. I happen to own these two sheets -- and if you are a Technique Junkie, you probably recognize them from the tutorials and the artwork pages. 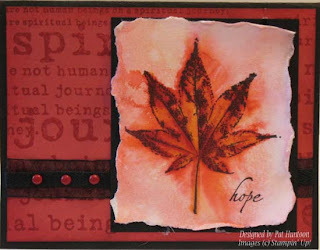 These deeply-etched, beautiful images are just a sampling of the gorgeous stamps offered by Innovative Stamp Creations. 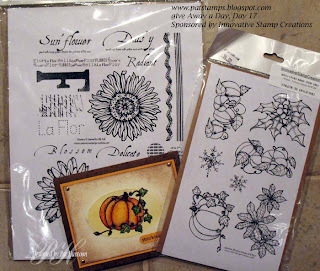 Along with the two stamp sheets, you will receive my fall creation on the right. 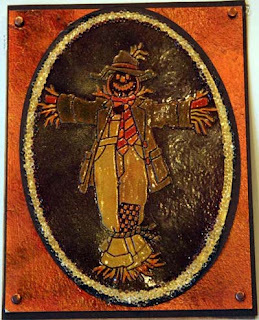 The pumpkin image is colored with Pencils and Gamsol, then covered with a light sheen of Crystal Effects to make it shine. 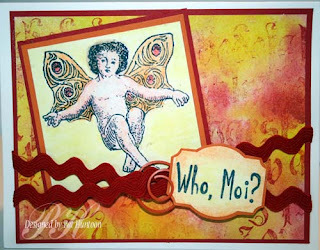 The card is finished by using the stippled frames technique from the June/July 2007 Technique Junkie Newsletter to highlight the image. 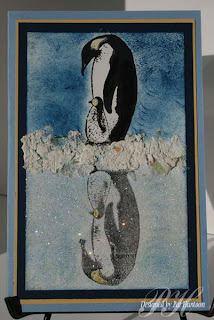 To add a bit of pizazz, I dry embossed the oval frame lightly. Here are the details on how you can win today's Give Away:ANYONE can enter. One entry per person, per daily give away please. 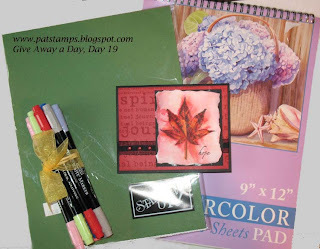 To enter the give away for today, simply leave a comment on this blog entry telling me that you would like to enter by 11:59pm EST on Thursday, October 18th. No other entry methods will be included in the give away. If you email me to enter, your entry will NOT be considered as a valid entry. When you leave the comment, make sure to put your NAME in the comment -- if you enter your comment as "Anonymous", I cannot give you the prize! Blogger does NOT record your email address for me, so you will need to check back to find out if you have won -- or include your email address in your comment so that I can notify you. I will have a random number generator pick a number from the comments to select the winner. Each give-away is separate, so to be eligible for a specific item you must enter that day's contest on the post where it is listed.Check back every day during the month of October for the daily giveaway -- you can enter EVERY day! A fabulous Grand Prize will be offered on the last day of the month, too. Enter today -- good luck! The lucky winner of this Give Away is Pat Stuart! Congratulations, Pat! Ready to celebrate the 5th Anniversary of the Technique Junkie Newsletter today? Today is Day 16 of our Give Away a Day, and the best way to celebrate is to give away something wonderful! 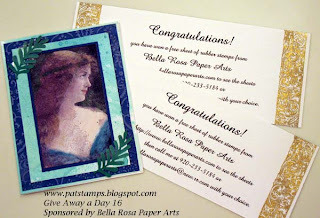 Today you have a chance to choose TWO beautiful stamp sets from Bella Rosa Paper Arts! 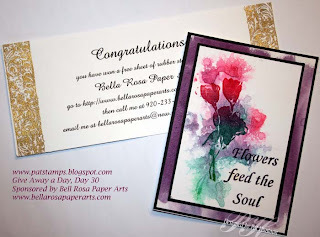 The very lucky winner of today's give away will receive two certificates, each good for a free stamp sheet from Bella Rosa Paper Arts. The stamp sheets from this company are absolutely DIVINE. 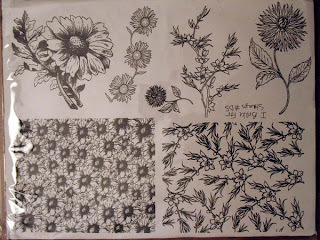 As soon as I finish this post, I am off to order the GORGEOUS new sheet of flower stamps on Linda's website. I have to hurry though -- because when you get there, you will want it too!!! 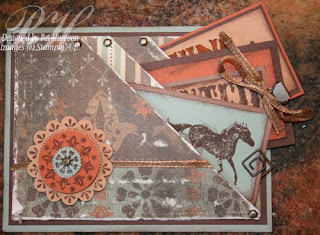 In addition to the certificates, you will receive today's eye candy -- which, of course was made with Bella Rosa Paper Arts stamps. This gorgeous image was so easy to work with! 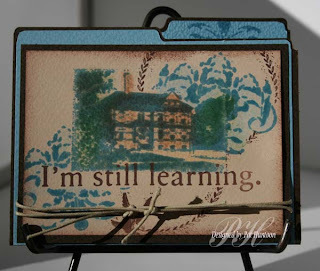 I used a blender pen and chalks to color the image, and I mounted that on a background made using the Color Wash Smoosh technique -- it is a bonus technique on the 5th Edition CD of the Newsletter. This car will be mailed to you with the gift certificates. Here are the details on how you can win today's Give Away:ANYONE can enter. One entry per person, per daily give away please. To enter the give away for today, simply leave a comment on this blog entry telling me that you would like to enter by 11:59pm EST on Wednesday, October 17th. No other entry methods will be included in the give away. If you email me to enter, your entry will NOT be considered as a valid entry. When you leave the comment, make sure to put your NAME in the comment -- if you enter your comment as "Anonymous", I cannot give you the prize! Blogger does NOT record your email address for me, so you will need to check back to find out if you have won -- or include your email address in your comment so that I can notify you. I will have a random number generator pick a number from the comments to select the winner. Each give-away is separate, so to be eligible for a specific item you must enter that day's contest on the post where it is listed.Check back every day during the month of October for the daily giveaway -- you can enter EVERY day! A fabulous Grand Prize will be offered on the last day of the month, too. Enter today -- good luck! Today's winner is Karen Indendi! Congratulations Karen! Today's give away is AWESOME. 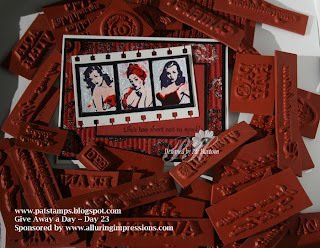 Alluring Impressions has donated this HUGE pile of gorgeous rubber stamp images that have to be seen to be believed! 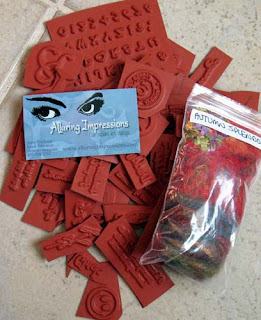 Someone is going to improve their stash of rubber stamps in a serious way! Amy and Kerri from Alluring Impressions have been long-time supporters of the Technique Junkie Newsletter, and their generosity with this Give Away shows it! 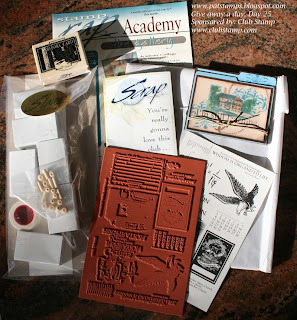 If you have never visited this website you are in for a treat when you discover them...great stamp images, lots of accessories, easy ordering -- it doesn't get much better than this! Your give away will include everything you see here -- the big pile o'rubba, the fibers, and the eye candy below. Just take a look at the card swallowed by all that rubber to get an idea of how good this really is!! ANYONE can enter. One entry per person, per daily give away please. To enter the give away for today, simply leave a comment on this blog entry telling me that you would like to enter by 11:59pm EST on Tuesday, October 16th. No other entry methods will be included in the give away. If you email me to enter, your entry will NOT be considered as a valid entry. When you leave the comment, make sure to put your NAME in the comment -- if you enter your comment as "Anonymous", I cannot give you the prize! Blogger does NOT record your email address for me, so you will need to check back to find out if you have won -- or include your email address in your comment so that I can notify you. I will have a random number generator pick a number from the comments to select the winner. Each give-away is separate, so to be eligible for a specific item you must enter that day's contest on the post where it is listed.Check back every day during the month of October for the daily giveaway -- you can enter EVERY day! A fabulous Grand Prize will be offered on the last day of the month, too. Enter today -- good luck! The lucky winner of this pile o'rubber is Carole Miller! Congratulations, Carole! It is already Day 14 of the Give Away a Day to celebrate the 5th year anniversary of the Technique Junkie Newsletter, and today we have something great for you! 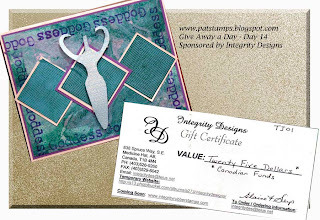 Today's giveaway is for a $25.00 (Canadian) gift certificate from Integrity Designs. 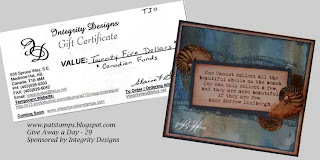 If you haven't been to the Integrity Designs website you need to go now! Pick out $25.00 worth of merchandise - because if you win, they will be yours! 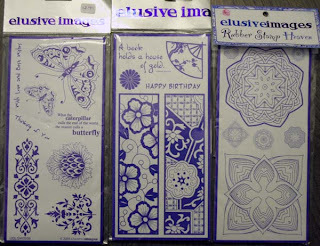 Integrity Designs carries some of your favorite stamp companies...Innovative Stamp Creations, Cherry Pie Rubber Stamps, Time to Stamp, non Sequitur, Starving Artistamps, and many others! In addition to your gift certificate, you will receive today's eye candy. 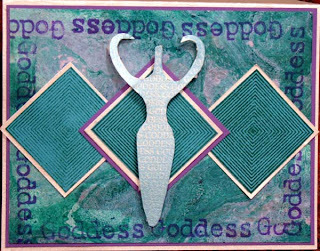 the Goddess card on the left was made using the Simple Sumi technique from the October 2005 newsletter -- can you believe that was two years ago already? It feels like just yesterday! 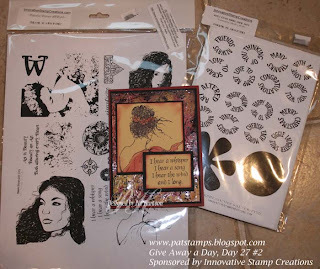 The stamps used are from Cherry Pie -- one of the stamp companies carried by Integrity Designs Rubber Stamps. First, ANYONE can enter. One entry per person, per daily give away please. To enter the give away for today, simply leave a comment on this blog entry telling me that you would like to enter by 11:59pm EST on Monday, October 15th. No other entry methods will be included in the give away. If you email me to enter, your entry will NOT be considered as a valid entry. When you leave the comment, make sure to put your NAME in the comment -- if you enter your comment as "Anonymous", I cannot give you the prize! Blogger does NOT record your email address for me, so you will need to check back to find out if you have won -- or include your email address in your comment so that I can notify you. I will have a random number generator pick a number from the comments to select the winner. Each give-away is separate, so to be eligible for a specific item you must enter that day's contest on the post where it is listed.Check back every day during the month of October for the daily giveaway -- you can enter EVERY day! A fabulous Grand Prize will be offered on the last day of the month, too. Enter today -- good luck! The winner of this Give Away is Ramblin Rose! Congratulations, Rose! Well this will be lucky 13 for one lucky winner! 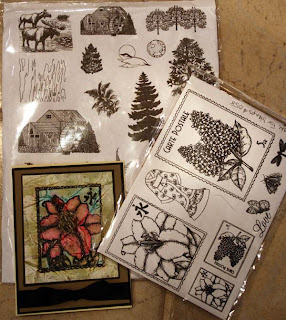 For today's Give Away a Day, we have three unmounted stamp sets from The Lilac Tree, a lovely online craft store based across "the pond." 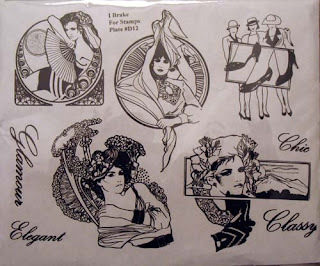 These are beautiful stamps are an elegant style that you will love. Make sure to visit her store! 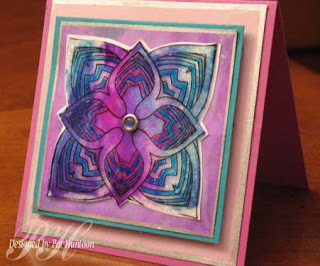 Today's eye candy is a card made from the Mandala stamps from The Lilac Tree. The image was colored using the Marbled Crystal technique fr0m the October 2006 issue of the Technique Junkie Newsletter, along with the Gel and Acetate technique from 2004. The Mandala is layered on White paper, which is layered on a piece of pink Silken Mist background from the October 2006 issue. 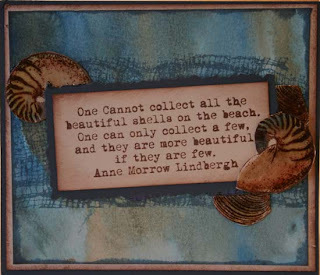 This card will be sent to the lucky winner along with the stamp sets. As you can see from the picture, the image on the set in the right bottom corner was the one I used for the example card...literally. I actually opened the package and cut the unmounted stamp so that I could make the card for you. So, gentle blog-contest-enterer, be aware that the mandala is lightly used : ) I am hoping that the winner won't mind too much. First, ANYONE can enter. One entry per person, please. To enter the giveaway for today, simply leave a comment on this blog entry telling me that you would like to enter by 11:59pm EST on Sunday, October 14th. No other entry methods will be included in the give away. Ig you email me to enter, your entry will NOT be considered as a valid entry. When you leave the comment, make sure to put your NAME in the comment -- if you enter your comment as "Anonymous", I cannot give you the prize! Blogger does NOT record your email address for me, so you will need to check back to find out if you have won -- or include your email address in your comment so that I can notify you. I will have a random number generator pick a number from the comments to select the winner. Each give-away is separate, so to be eligible for a specific item you must enter that day's contest on the post where it is listed.Check back every day during the month of October for the daily giveaway -- you can enter EVERY day! A fabulous Grand Prize will be offered on the last day of the month, too. Enter today -- good luck! The winner of this Give Away is Debbie Ebat! Congratultions, Debbie! Give Away a day - Day 8 --Double Celebration! Give Away a Day - Day 2! Celebrate with us!